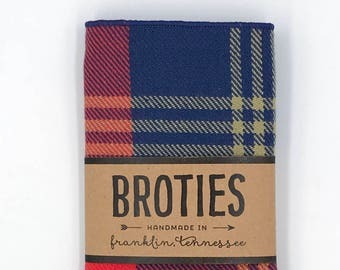 Announcement Welcome to BroTies Neckwear, where you'll find bow ties and pocket squares fit for the Southern gentleman. Find our pocket squares in Southern Living's 2016 Holiday Gift Guide online! Don't see something that you like? No worries. We also make totally custom orders to fit your unique style. Feel free to contact us with any questions or requests. No request is too big or too small! Welcome to BroTies Neckwear, where you'll find bow ties and pocket squares fit for the Southern gentleman. Find our pocket squares in Southern Living's 2016 Holiday Gift Guide online! Thank you so very much! Item was perfect!!! Beautiful! The person who received it as a gift was in love with it. Our goal here at BroTies is to make your bow tie dreams come true! If we do not have a bow tie that fits your unique style feel free to contact us. We will do our best to find the perfect fabric for you. Want to get even more customized? We can monogram any initials into the band of your bow tie. Simply put the desired initials into the "Note to the Seller" box. Our goal here at BroTies is to serve you! If you are in any way unhappy with your order please feel free to notify us and we will work to rectify the situation, whether it be issuing a refund or sending a replacement item! Orders are made to order and will be shipped upon payment; those not paid within 7 days will be cancelled. Sales tax is collected for orders shipping to Tennessee. 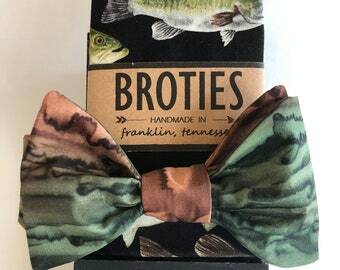 All bow tie orders will be shipped within 2-3 business days, unless otherwise noted, and will be shipped USPS First Class Priority mail (3-5 business days). Need your item faster? No problem! Please contact before ordering if you need expedited shipping. International Orders are also shipped using USPS; shipping price covers the cost of sending First Class International; expected delivery time is 1 to 2 weeks depending on your location. -Priority International for $20 (6-10 business days), no tracking or delivery confirmation available. -UPS for $70 (3-5 business days) , includes tracking and delivery confirmation.